Bacterial Infections and Pneumonia: What is the Role of Toll-Like Receptors? The lung is the largest surface area of the body in contact with the external environment and it is constantly exposed to a wide array of microbes and particles. As a result the body’s immune system evolved a series of systems which enables it to distinguish potentially harmful agents from those which are innocuous. Two of the major systems are the adaptive and innate immune responses. The innate system is fast responding and recognizes a wide variety of potentially noxious stimuli coming into the lungs. In the majority of cases these may be microbial products, however on occasion the innate immune system can also respond to host-derived danger signals not normally encountered in the healthy lung. A key component of this response is the germ-line encoded pattern recognition receptor family of Toll-like receptors. TLRs regulate the lung’s response to potential pathogens or other environmental hazards and communicate closely with the adaptive immune response to orchestrate effective resolution of infection and a return to homeostasis. Our understanding of the role of TLRs in infectious, environmental and genetic lung diseases has advanced greatly over the last fifteen years. In this book experts from around the world offer their insights into the mechanisms of TLR-mediated responses in a number of common but serious diseases of the lung, and explore how our growing knowledge of the mode of action of TLRs can be exploited for therapeutic use. Since the discovery of the mammalian Toll-like receptors in the 1990s, we have seen advances in our understanding of the basic biology, genetics and function of this family of proteins at a rate rarely paralleled. 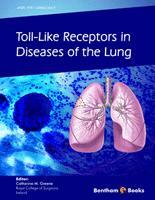 It is hoped that this book will provide the reader with a comprehensive review of what is now known regarding the roles of TLRs in maintaining pulmonary health and will outline why TLRs are so important in orchestrating the host’s innate immune response during a variety of common and often life threatening pulmonary diseases. Topics that are covered in the ten chapters include the expression, function and activation of TLRs during bacterial, viral and fungal infection of the airways – concentrating on global diseases such as pneumonia and tuberculosis; the role of TLRs in the pathogenesis of important genetic and environmental pulmonary disorders such as cystic fibrosis, COPD and asthma; and TLR biology in the context of transplantation. Each chapter highlights recent advances in the area, explores the usefulness and current status of TLR-directed therapies and all are written by leading experts in the field.